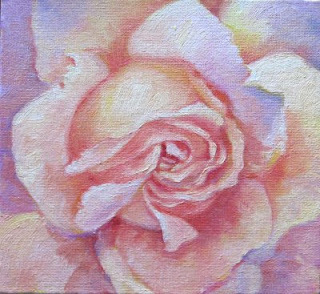 Have been feeling a bit tired after the Gettysburg Festival Plein Air Paint Out, so I decided to stay home today and work on something small. I had a blast playing with the colors in this one, and am pretty happy with the end result. 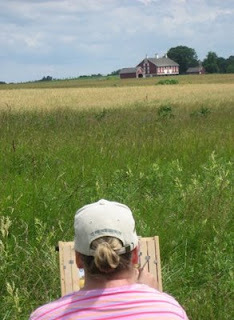 Plein air painting on the Gettysburg Battlefield was an incredible experience I will not soon forget. Over the past nine days of painting and making new friendships with some very talented artists, learning more about the battle of Gettysburg from the tour guides, talking to interested observers, and fighting off bugs and heat, several thoughts came to mind. First of all, many thanks to Mary Beth Brath and Peter Plant for organizing this entire event, and then for pulling it all together for a fantastic exhibit. It takes a lot of thought and effort to make this work successfully, and you both did an amazing job. (Pictures from the exhibit will be further down this entry). 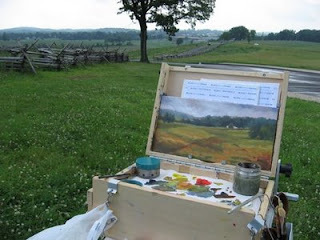 I also want to thank everyone who has followed the progress of this plein air event on my blog, all the folks at Wet Canvas who have followed this event's daily progress and have provided so many kind words and encouragement, and also thanks go to the people who read this blog, and sent me amazing emails about their experiences on the Gettysburg Battlefield. You all have added to this experience in ways I will forever appreciate. There are many different ways to learn how to paint, but it has always been my contention that the act of painting itself is the best teacher. Picking up that brush, dipping it into some paint, and attacking the canvas each day will teach you something new every time, and the more mistakes you make, the more you will learn along the way. 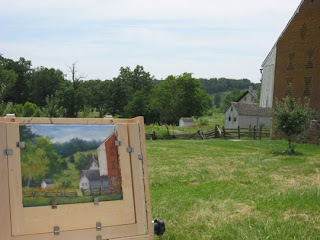 You can't be afraid when you're out there plein air painting - you have to push yourself out of your comfort zone. It is so easy to be complacent, to find the easy way and stick with it. 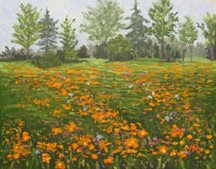 For example, when painting the summer landscape, you will be surrounded by many, many different shades of green. It is easy to hold on to the notion we learned in grade school that 'green = yellow + blue'. As a painter, we need to stop, look and find the actual color that we need. Sometimes green has a lavender or blue cast, sometimes it is the deep olive green that you can get by mixing ivory black and cadmium yellow, and sometimes it really is just a yellow and blue mixed together. As an artist, what I marvel in is that sometimes when you really look, you will see that what you originally thought was green may not even be green at all! 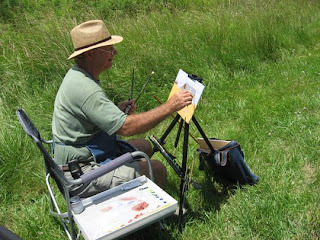 As a plein air painter, sunscreen and bug spray are your FRIENDS! 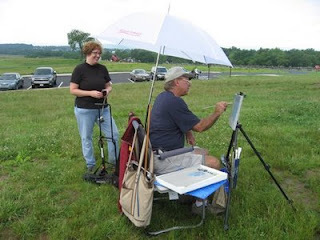 I also was very, very glad that I had the umbrella that attached to my Judson Guerrilla pochade paint box - especially the last few days of painting when it provided my only source of shade under a merciless, hot sun. Being on this historical site made me think more than once of my high school history teacher, Mr. Willis Kocher. He expected a lot, and gave back even more by bringing history to life each day in his classes. Thanks, Mr. Kocher! Kudos to the Gettysburg Battlefield tour guides. Each day I heard snippets from many different guides as they led tourists through the various battle sites. Talk about having a passion for your work - these folks are incredible. 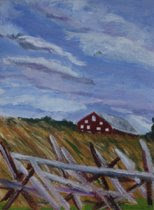 Today was the last day to paint before we deliver the paintings for the exhibit which will be opening on Saturday June 27, 2009 at the Gettysburg Presbyterian Church, 208 Baltimore Street, Gettysburg, PA 17325. There will be a reception from 6:00 P.M. to 8:00 P.M. Everyone is welcome! I went back to the Trostle Farm to paint today because when I had been there earlier in the week, I had seen some daylilies that were growing beside one of the outbuildings. Although I had taken some good photographs of them, I wanted to go to the site to paint. It was a hot one today - in the 90's, and my source of shade was a little apple tree that was at most two and a half feet tall. I was the only painter at the site, but I was visited by quite a few people on horseback who were taking a guided tour of the battlefield. Of course they all wanted me to paint them into my picture! 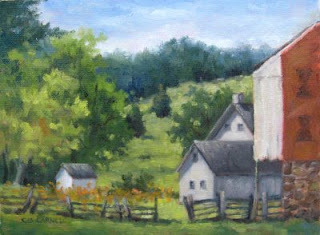 Just a note of interest - the Trostle Barn (right-most building in my painting) has a large artillery shell hole in the front brick face that was created during the second day of the battle. 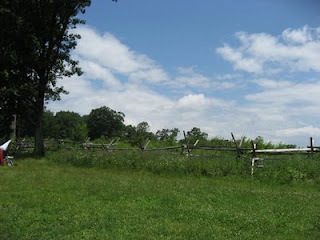 The Trostle farm is located almost in the center of the Gettysburg Battlefield, and was the site of some of the heaviest fighting. Another artist from the plein air event, Dorothea Barrick, stopped by to visit me and she took some pictures of the daylilies as well. 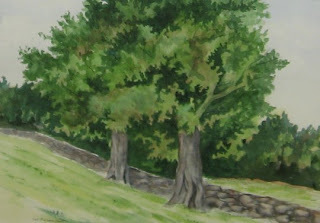 Here are some paintings that Dorothea will be exhibiting at the opening on Saturday. 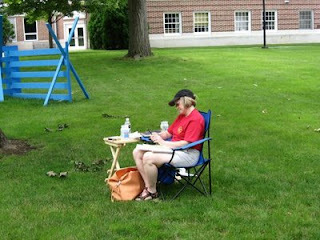 The seventh day of the Plein Air Paint Out - and none of were resting. We met up at the Weikert farm, then some of us branched off to different locations. Here's my painting for today. There were several rows of fences (white picket, then wood fences) right in front of the house but I decided to edit them from this effort. 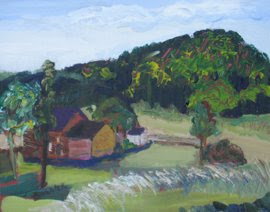 If I were starting the day over, I may have painted from further back, or just focused on the house itself. 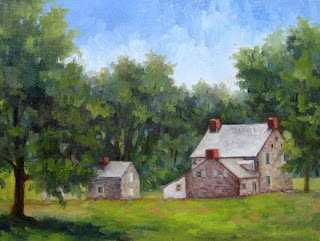 Lyn O'Neal was working on a painting of the Weikert House. She had a terrific start, and I am looking forward to seeing the completed painting. Deborah Richardson was also working on the Weikert House, and had a beautiful start by the time everyone was meeting up for the day. 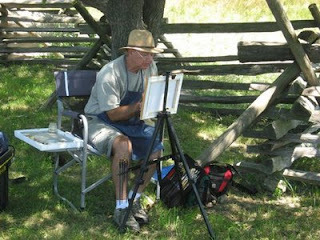 Glenn Souders was lucky enough to find a nice spot in the shade to paint. 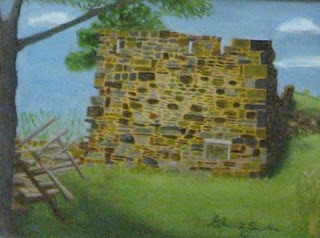 He is working on a painting of the Rose barn ruins - which were quite interesting. We noticed that a lot of the stones along the top rows of the ruin have been painted with numbers. Will have to look into this when time allows. 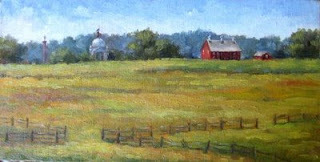 Today the majority of the painters were situated up on Seminary Ridge, very close to the North Carolina Monument. This vantage point overlooked the field of Pickett's Charge. 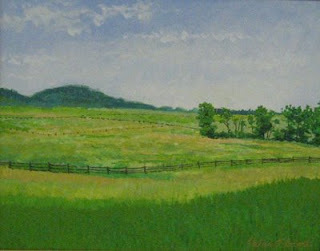 My first painting done on site today is a vista from Seminary Ridge, in which you can see the fields of Pickett's Charge, the Vermont State Monument, the Pennsylvania Monument and the front side of the Codori Farm (yes, this is the same farm I painted yesterday, just the opposite side.) 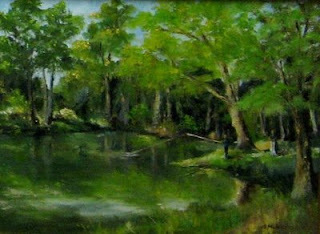 It is 6 X 12, oil on canvas. 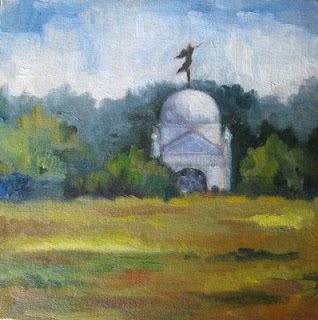 My second painting done on site today is a 40 minute study of the Pennsylvania Monument. It was very far away, so I was trying to just capture the essence, and not worry about any details (not that I could see them from that distance!) Oil 8 X 8 on canvas. Sharon Benner and Sue Gray take a look at Sharon's beautiful work. Sharon got on site early to take advantage of the early morning light. Bill Fosnaught sets up his equipment to get ready to paint for the day. 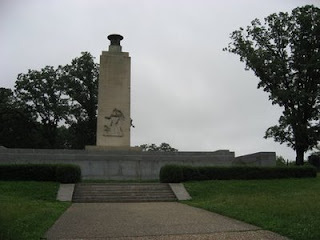 Here is a photograph I took of the North Carolina monument. This amazing piece of sculpture was created by the same artist who designed Mount Rushmore, Gutzon Borglum. I may be posting more pictures later on tonight, so please feel free to stop back in! Day Three and Four of the paint out were only attended by a couple of the artists (bad weather and Sunday being Fathers Day didn't help), and there weren't any pictures. This entry will start with today, Day Five - and what a day it was! Still some cloud cover, but beautiful patches of blue in between. 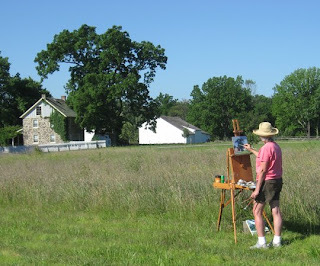 Mary Beth and I were talking and agreed that plein air painting just doesn't suit everyone. 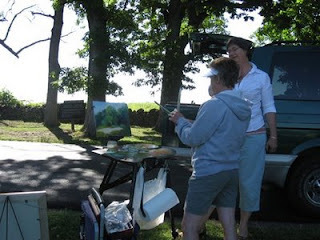 I really liked her comment "to be a Plein Air painter, you have to be tough! It is not for everyone. We work through various weather conditions, bugs, rodents, reptiles, tourists, bad maps and directions. The positives so outweigh the negatives for us. There is nothing like seeing the colors, textures and feeling the mood of the landscape when painting directly from nature. 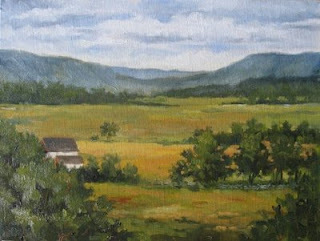 Once seasoned as a plein air painter, painting from a photo is never the same". 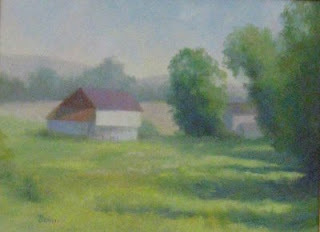 Today's paintings were done of the Trostle Farm, the Codori Farm and the Weikert Farm. Thanks to those who sent me some additonal photographs to add to this blog! 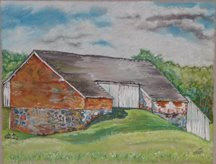 My painting today is of the back view of the Codori Farm - which happens to be one of my favorite barns on the battlefield. The sky was ever-changing, and so much fun to paint. 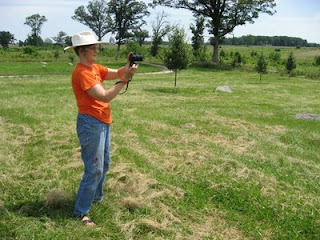 A picture of me at work - you can see the Codori farm in the distance. 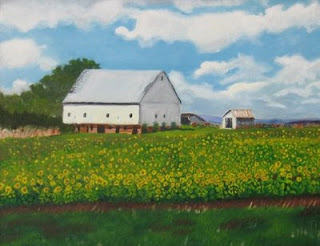 I really enjoyed hearing and seeing the red-winged blackbirds in the fields while I was painting. 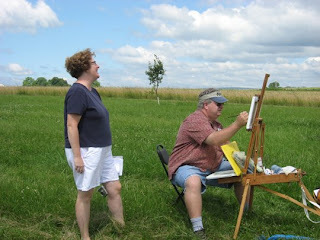 The co-ordinators of this plein air event, Mary Beth Brath and Peter Plant. Everyone was really enjoying the beautiful weather. 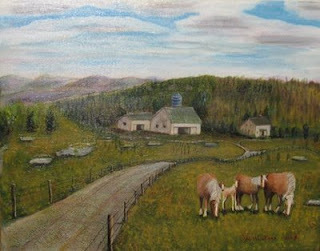 Dorothea Barrick worked from the back of her car while she was painting the Trostle Farm. 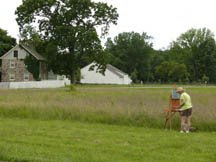 Rebecca Jackson is painting the Trostle Barn as Sharon looks on. 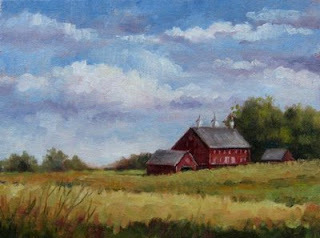 Glenn Souders painted the Trostle Farm from a different angle. 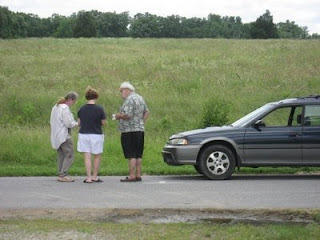 Susan Remmers, Mary Beth Brath and John Hagerhorst work out where they will be painting today. 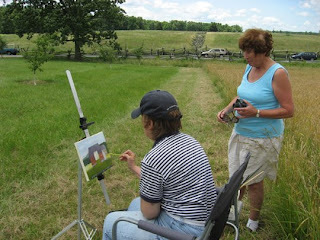 Lyn O'Neal and Deborah Richardson painted at the Weikert Farm. 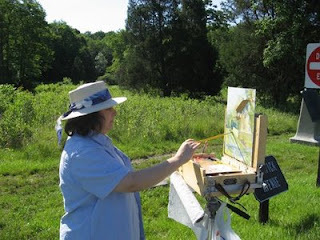 Here is a photograph of Deborah getting started. 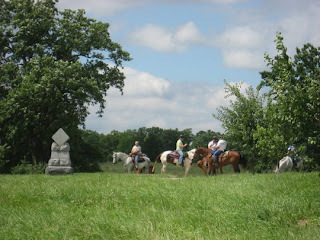 They have all kinds of tours on the battlefield, including tours where you can ride the trails on horseback, and each person is provided with a headset so that they can hear the tour guide. Even the horses seemed to enjoy seeing the artists at work! We had a beautiful day for painting today. 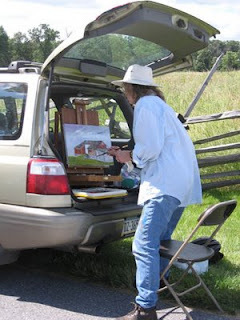 Most of the artists painted on site at Gettysburg College, but some of us set off for Little Round Top. What an amazing experience we had there - people of all nationalities; groups of children, groups of our armed forces men and women, and the fantastic Gettysburg Battlefield tour guides. Many people stopped to see our work and chat - it was lots of fun. One group of Italians (who could speak no English) looked at our paintings and said "Bella, Bella! Bravissimo!" - I am pretty sure that meant that they liked what they saw! 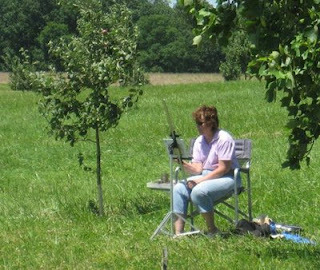 Every time I plein air paint, I get lots of questions about my gear. I am beginning to think I should be a sales rep for Judson's! Here are some photos. 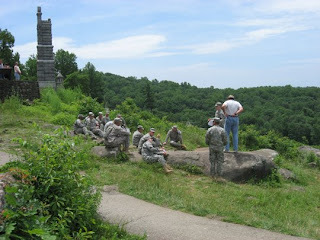 This first one is a group of our military listening to the tour guide. 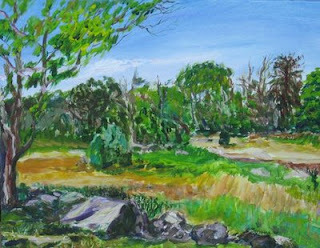 This is the view from Little Round Top that I painted today. What a lovely, serene vista. 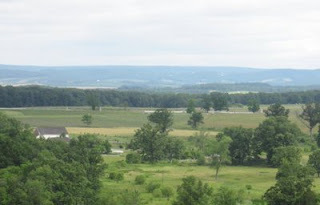 It's hard to even fathom the death and destruction that took place there during the Battle of Gettysburg. But I swear you can feel the presence of the people who fought there. And this is my painting for the day. Here are two additional pictures that were taken by Mary Beth Brath. 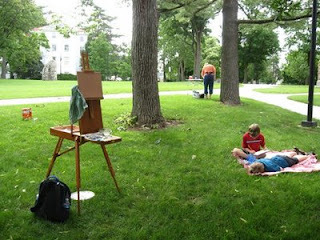 Both scenes are from artists painting at the Gettysburg College on Day Two. 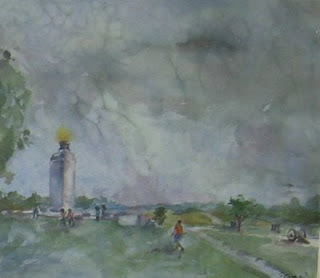 Our first day of the Plein Air Paint-out started at the Peace Light Monument on the Gettysburg Battlefield. The skies were a bit gloomy, and every once in awhile there was a drop or two, but we were so lucky that the rain kept away. Mary Beth Brath (one of the co-ordinators of this paint-out), talks to Glenn Souders as he works on a painting of the Peace Light Monument in acrylics. 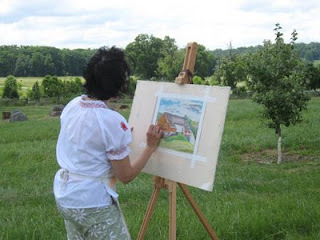 Rebecca Jackson, from Frederick, MD works on her painting. I am working with my Judson Guerrilla Painter 9 X 12 Pochade box, oil paints, and a 6 X 12 canvas panel. It is my first outing with the Judson heavy-duty tridpod, and it made a huge difference - no more wobbling of the pochade box. My back was to the Peace Light Monument, and the little barn in the distance is the McPherson farm on the Gettysburg Battlefield. Painting is about three-quarters complete at this point. Finally, some gorgeous blue skies! Sure hope we see more of this tomorrow. 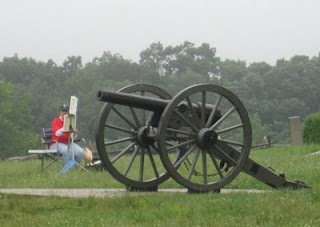 Most of the painters are going to be painting at the Gettysburg College, but a few of us (including myself) are going to paint at Little Round Top.